# separated one. Only needed when the type is "ingress". # the value of "expose.ingress.hosts.core"
# the value of "expose.clusterIP.name"
# is needed in the k8s cluster to provision volumes dynamicly. # Specify another StorageClass in the "storageClass" or set "existingClaim"
# StorageClass will be used(the default). # The secret key used for encryption. Must be a string of 16 chars. 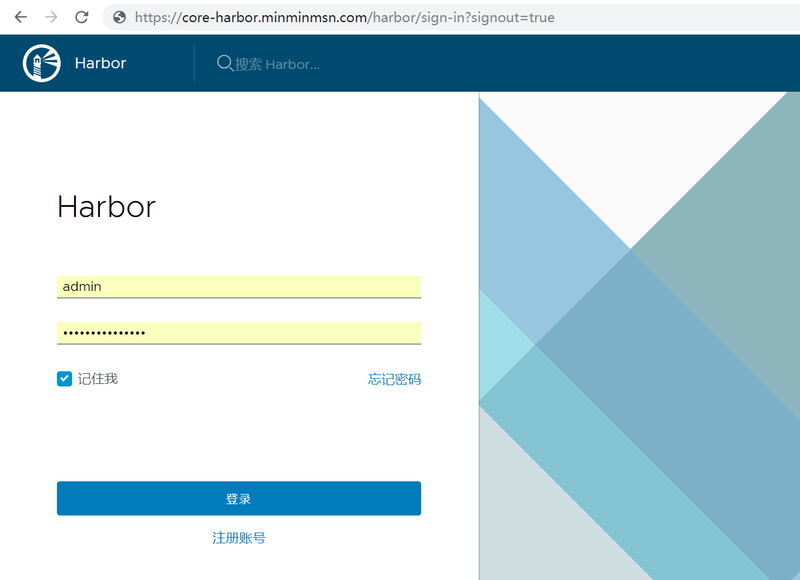 # The logger for jobs: "file", "database" or "stdout"
# if external database is used, set "type" to "external"
# if external Redis is used, set "type" to "external"
Then you should be able to visit the Harbor portal at https://core-harbor.minminmsn.com. For more details, please visit https://github.com/goharbor/harbor.